Upon successful completion of the program, students will be awarded a Diploma. Students are tested at the end of each quarter. Tests are written and oral. A hands-on test is given pertinent to the specific breeds of study for that quarter. 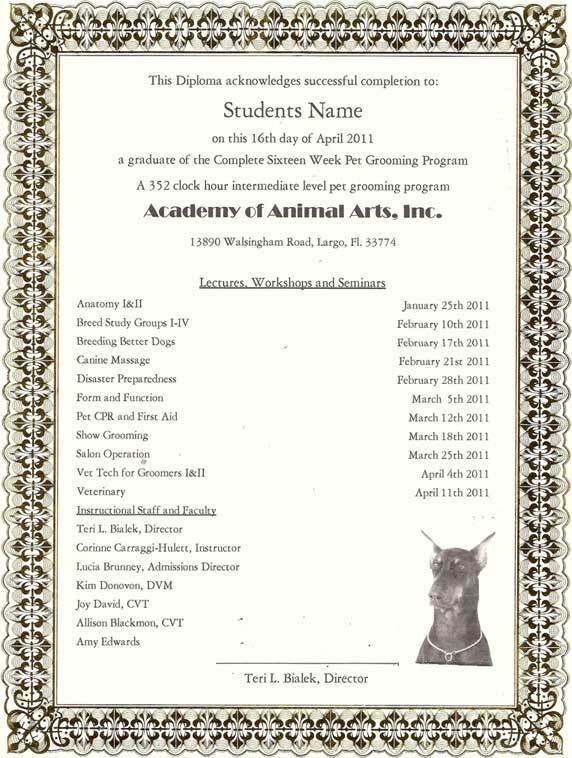 Students are tested on their individual accuracy of styles that are Breed specific. They are also tested on their homework assignments, their ability to control the animal, their creative and artistic ability and their ability to deliver a finished product. A Diploma will be presented to the student that has, completed all required hours and programs, has passed the tests with a grade score of 70 or above, and has paid in full all tuition and costs of equipment and supplies. Students receiving a final score of 69 or below, will be placed on probation, will be encouraged to attend additional classes and will not be recommended for placement until successful completion. The probation period will last two weeks, and, during this period, the grade score must be raised to 70 or better. Failure to achieve a passing grade at that time will result in counseling by the Director to determine whether the student should continue the program.